Despite all of the destruction left in the wake of the California wildfires, a heartwarming story took place at a home in an evacuated area. A family who was evacuated was forced to leave their dog behind and he stayed at the home and guarded it for nearly a month until his owner returned. 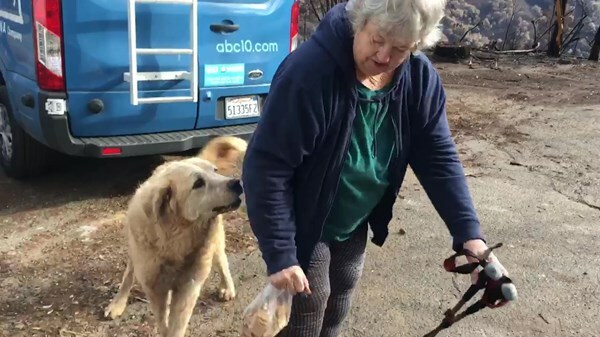 The story began when Andrea Gaylord left her home due to a mandatory evacuation, but despite her home being destroyed by the fire, her dog stayed behind and watchfully guarded it until her return. The dog is an Anatolian shepherd named Madison and she was alone at the home since Ms. Gaylord fled on November 8. The fire devastated the entire town of 27,000 people but Madison held out hope that his owner and best friend would return. Gaylord requested an animal rescuer check on Madison several days later. The animal rescuer, Shayla Sullivan, said the outdoor guard dog was wary of her and would not let her get too close. Despite Madison's apprehensiveness, Sullivan returned regularly to bring him food and water until Ms. Gaylord could return on Wednesday. Sullivan was also instrumental in finding Madison's brother, an Anatolian shepherd mix named Miguel. When Miguel was located he was taken to a shelter 85 miles away from the burned out town. Sullivan was later quoted as saying, "If the evacuees can’t be there I’m going to be and I’m not going to give up on their animal until they can get back in." Both Madison and Miguel were reunited after the confusing aftermath of the fire when Ms. Gaylord returned home with Miguel in tow. She also brought Madison his favorite treat for his efforts, a box of Wheat Thins. "Imagine the loyalty of hanging in in the worst of circumstances and being here waiting," Ms. Gaylord said. "Their instinctual job is to watch the flocks and we’re part of them,” Ms. Gaylord said about her dogs. "It's a comforting feeling."